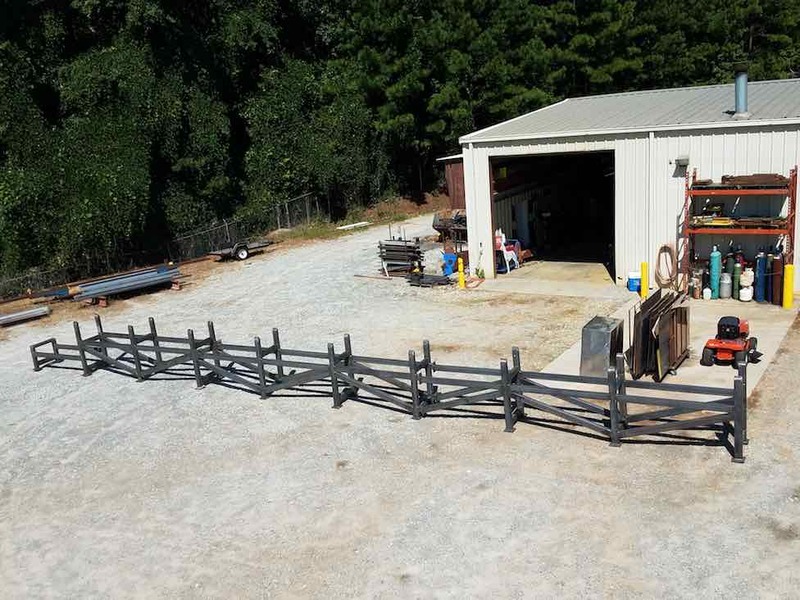 I visited my friend JD Brewer again while he was building a 60 ft long metal rack project. This metal rack was made from 3/16" (4.5mm) wall tubing...and welded with .035" (.9mm) Lincoln 71m dual shield flux core. The reason for using .035" diameter wire was mainly due to uphill welds with the flare bevel grooves. .045" would have worked also but .035" was already in the shop and was a good choice for out of position welding as well as the flat and horizontal welds without any need to change welding parameters. 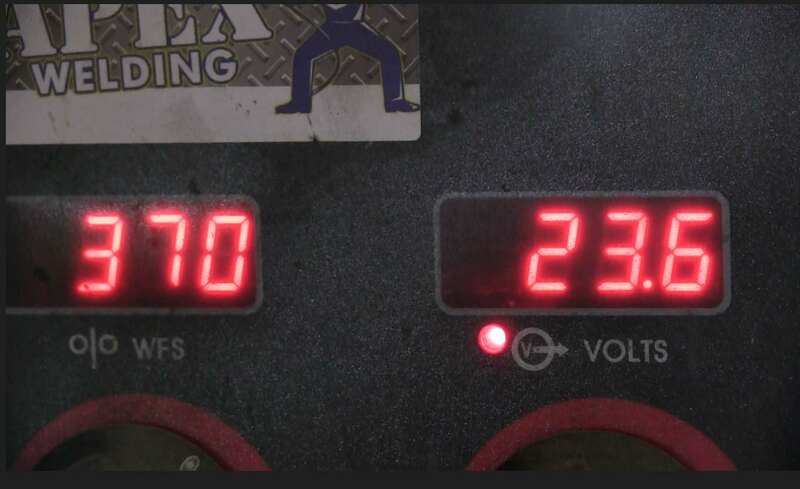 23.6 volts and 370 ipm of wire speed worked out well while using C25 gas and .035" (.9mm) Lincoln 71m outershield wire. .035" was used because it seemed to work better for the vertical uphill welds on the flare bevel welds. We all know that best practice for any type of welding is to remove the mill scale before welding. And there are very different types of mill scale. Mill scale on thick hot rolled plate always seems to be much thicker and harder to remove than the mill scale on square tubing. If I were tig welding this tubing, I would definitely remove mill scale. I might even take time to remove the mill scale if I were going to use short circuit mig welding. But for dual shielded flux core that easily burns thru mill scale, I am not so sure it would be worth the effort. In fact, I would say for this particular job, grinding and cleaning mill scale would have been a waste of time. Yes its true that certain welding codes like AWS D1.1 require removal of mill scale for welding. But there was no welding code specified on the drawing. The process was not even specified either. In my experience, the drawing often does not specify a welding code. but its never a bad idea to follow the standard practices that are listed in a code like D1.1. Dual shielded Flux core was chosen due to the fact that its such a tried and true and productive process that is not very sensitive to a little bit of mill scale. A spreader bar is something that is very commonly used in construction rigging. It allows 2 pick points and helps to balance large heavy parts like the rack in this video. There are spreader bars available for purchase but often times they are fabricated as needed. 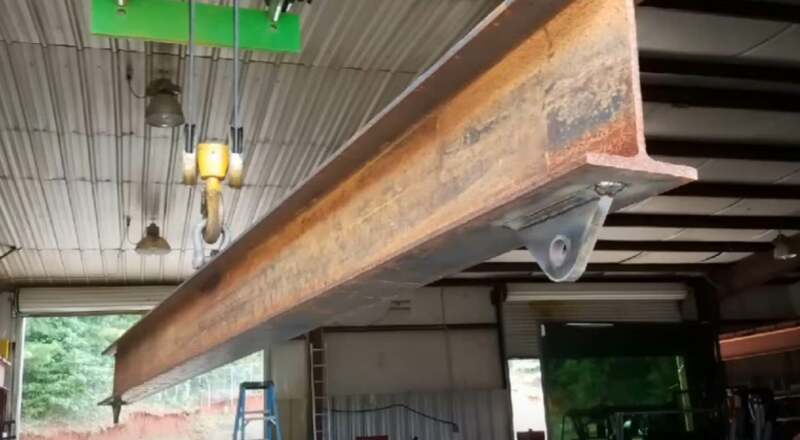 For this metal rack project, a spreader bar was needed on the weekend so JD just built one using the PlasmaCam to cut the lifting lugs and he welded those lugs onto a heavy I beam using Lincoln 71m wire.